Ox in the road | Walk with us! Since it is Sunday morning all the students are out on pastoral assignments. Just to give you a few examples: Harish, Benarji, Thambi and Syam (two second and two first-year theologians) are at Vempada, our own SCJ parish; while Anu and Vineeth, both third-year theologians, are at the cathedral. Instead of staying home alone I took Fr. Joseph Gopu’s 7:00 a.m. Mass at the Holy Family Brothers House of Studies. It’s just down the road from us. Since it is a religious community of brothers they do not have a priest to celebrate the liturgy and our community provides the service. Fr. Joseph is the regular provider. He has two other Masses today; one at the cathedral and another in one of the substations of our parish.Br. Mary Babu and Br. Ajith joined me for Mass. They came by bicycle and Br. Prasad (all first year theologians) came by motorcycle after Mass with the intent of driving me home. I told Prasad that I vowed that I’d never get on a damn fool machine like that and would walk home. I was offered the chance to ride as a passenger on one of the two bicycles Mary Babu and Ajith used to get to the brothers’ house for mass. I said no, I’d rather walk as I enjoy walking (what I didn’t say it I think walking is a bit safer then a bicycle). Because I decided to walk they all decided to walk! The walk home took 20 minutes. It gave me a good chance to talk with Prasad and learn a few things about him and how he’s enjoying theology as a first-year theologian. Prasad is from the city of Guntur where a number of our students come from and where ordinations took place at its cathedral last February.As it turned out my decision to walk paid off as two ox carts were passing by and I have been trying since last January to get a good shot of this mode of transport. I call these carts our “sand stealers.” Across the road from our house runs a river that often is very low and is a good source of sand. The government allows locals to take the sand for use on their own land. However, I’m told more often then not they will sell the sand as a way of making a living. The carts can be seen coming and going all day and even into the dark of early evening. They can be a traffic hazard as they have neither head nor tail lights. The only way of seeing them at night before you run into them is a reflection off the bullocks since all the ones I have seen are an off white color.Since the cart can only go at a bullocks pace they are very slow on the road. 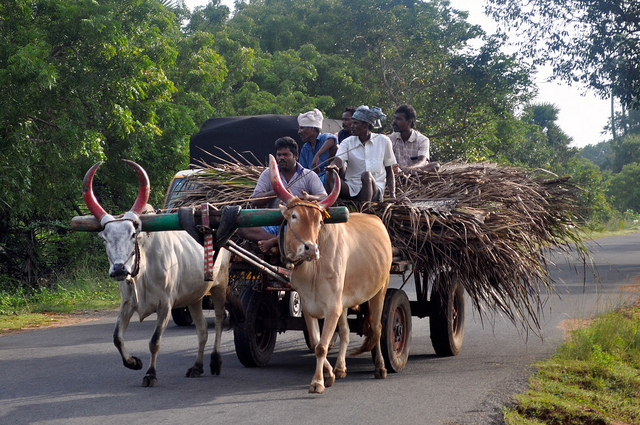 That’s not too difficult on our country road but you can find them on the four lane highway between here and Vijayawada more often than not taking cane to a sugar cane factory. Even though they are a road hazard I must confess I’ve never seen an accident involving one of them in my time here. PS: I forgot to note that on the way home we also met up with a monkey! The few times that I’ve seen them along the road they have usually been in a group. Br. Prasada told me when we spotted the monkey that one of the students was attacked by monkeys last week. It couldn’t have been much of an attack as this was the first I heard of it and none of the students came home with any injuries.